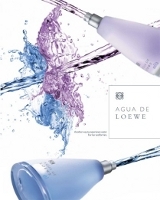 Loewe has launched Agua de Loewe El & Ella, new masculine and feminine flankers to 2000's unisex Agua de Loewe fragrance. The tag line: "another way to experience water". Agua de Loewe El is for the "modern yet classical man, with a casual-chic style and an unquenchable thirst for life"; the notes feature yuzu, bergamot, clementine, pink grapefruit, cassis, pineapple, green apple, sandalwood, cedar, musk and moss. Agua de Loewe Ella is for the "young, elegant, open-minded woman of today", and includes notes of bergamot, lemon, kumquat, passion fruit, rose, water lily, pepper, musk, cedar and sandalwood. Also new from Loewe: I Loewe You Tonight. Agua de Loewe El: fruit, fruit, fruit, fruit, fruit, fruit, fruit, and some base notes. maybe they think what the modern yet classical (??) man truly has an ‘unquenchable’ thirst for is…..fruit. Yup, you could put the first ingredients into a blender and have a great thirst-quencher right there. I never smelled the original Agua de Loewe, wonder if either of these has any relation to the original? The men’s does sound very fresh ‘n fruity! Very, and nice advert too. I also like the bottle, but I think it would be expensive. Will any of the Loewe fragrances be available in the US? I have never heard of this line. I would like to sample. Pineapple? Really? Is this what we’ve come to? Doesn’t even some remotely appealing. Hey, why not? Ananas Fizz seems to have a good following. In fact, pull the green apple out of that one and who knows? might be fun. I adore Ananas Fizz, but admittedly so far no other pineapple has worked for me…not a favorite note of mine. The “another way to experience water” line made me laugh. Another case of ad copy being phoned in. It’s like they didn’t even try. Might sound better in Spanish since the name of the perfume is “Water of Loewe”, right? The Mens Version sounds SPECTACULAR! I am salivating (ADORE PINK GRAPEFRUIT!) I hope i can find a bottle soon! Makes me Giddy! Is the Loewe line sold near you?